In BoT, Ti'ana describes the facial features of the D'ni people as having "a strange elongation of the features, that almost-human fineness to the bones". Is this supposed to be canon? Are there other differences between human and the D'ni? The D'ni look human in every aspect- except they are usually taller and slimer. And their eyes are pale and weak (that, I think, is special only to D'ni. I don't think the Terahnee or the original Ronay had such weak eyes). Also, they can live up to 400 years, and they are probably more intelligente. I believe the weak eyes is attributed to the dim light of the cavern, hence why they need the goggles (/me looks at Escher) on the surface and in many ages. Well, Ti'ana also wondered "how they saw her. Did they find her nose and mouth too thick and coarse, her cheekbones much too heavy, too pronounced, in her face?" I didn't notice this in Ghen or Esher. I was wondering if the book was takign liberties or if the games didn't reflect this. It IS canon that the D'ni had elongated heads in comparison to humans. 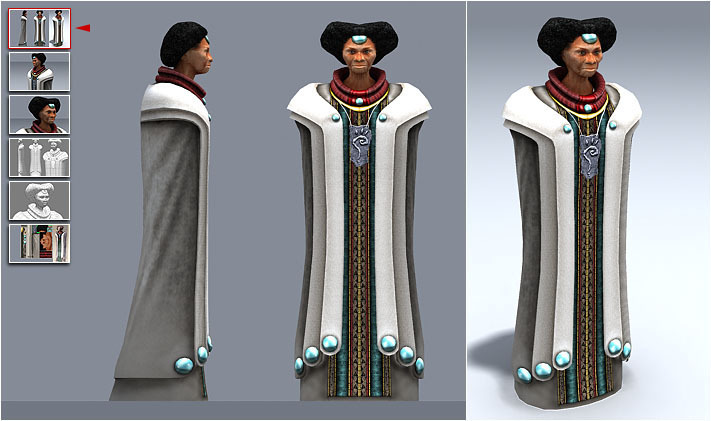 Their clothing also had very pronounced shoulders to compensate that fact, There are a few concept art pieces from the "seers" plotline of Myst V which was removed. Is this supposed to be someone specific? That particular individual is an early rendering for a character called the "Seer of Wisdom" Myst V's original plotline had these "Seers" 4 total who were eventually condensed into one character. That character later became Esher but the original concepts were quite unique. I believe Wisdom is the only one who was fiully rendered though, the others exist only as concept art.